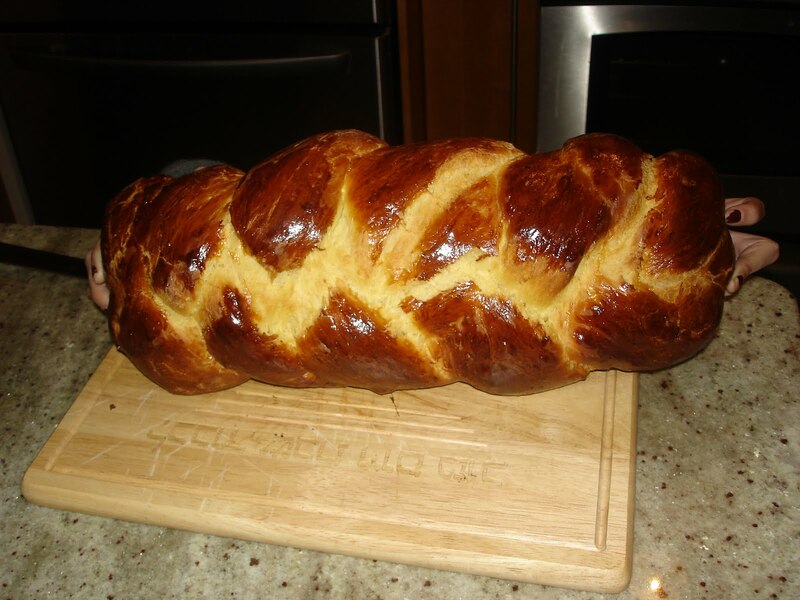 About 6 months ago, I decided to try making Challah in my artisan stand mixer. I was pretty confident at the time that I could do this, as long as I carefully followed a recipe. I had never made bread before, but this was shortly after the rainbow cookie success, so I was up for a challenge. 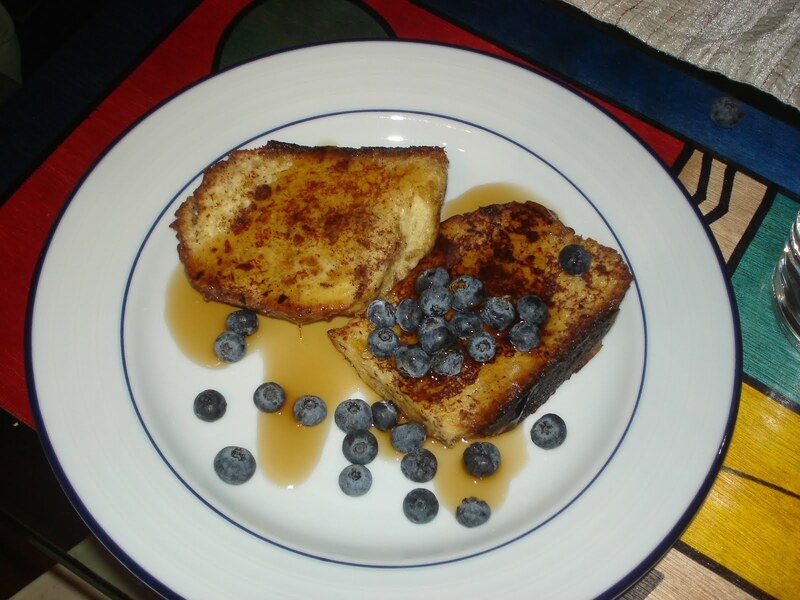 I decided to use the recipe in a Kosher cookbook that my Dad and Kim had given to Brad and I as a housewarming gift. 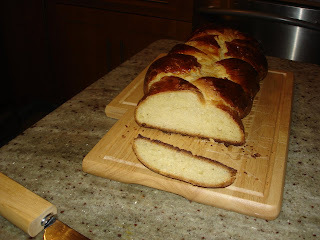 It seemed logical to use a kosher cookbook for this recipe, since it was Challah, after all. I had all the ingredients except for dry active yeast. I followed the recipe to the letter. When I used the dry active yeast, I followed instructions suggesting that I add a teaspoon of sugar to the yeast, activated in warm water, and then put it in a bowl in the oven on warm for 10 minutes. Although I didn't realize it at the time, the yeast did not activate and the dough did not rise. My husband, not realizing that something had gone terribly wrong, insisted that he would eat it anyhow if I braided and baked it. So I did. In the oven it went. When it came out, it was heavy as a boulder. The bread, according to Brad, who tasted it true to his word, was dense and heavy. I decided to try again with a new recipe that same evening, frustrated. 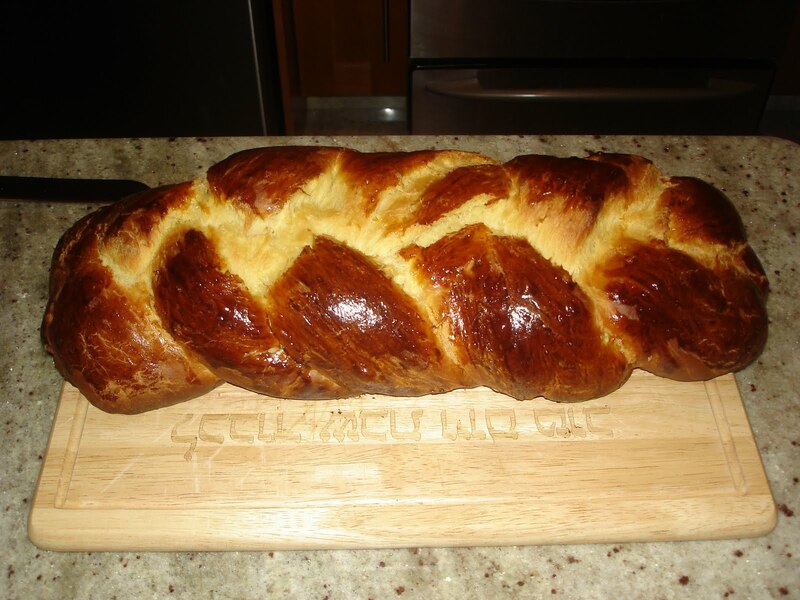 I had enough eggs, and bought some more dry active yeast, and began again using Martha Stewart's Challah recipe from her "Baking Handbook." I highly recommend this book as a baker's bible to anyone interested in teaching themselves how to bake, as long as they have an artisan stand mixer. This time, I activated the yeast in warm water, with a teaspoon of sugar and let it sit on the counter top for 10 minutes. The yeasty water became frothy and foamy, a sign that it truly had activated. I added the yeasty-water with the rest of the ingredients (flour, egg yolks etc . . .) as specified to the mixer. The I let the dough rise in a covered bowl for one hour. Sure enough, this time it doubled in size. 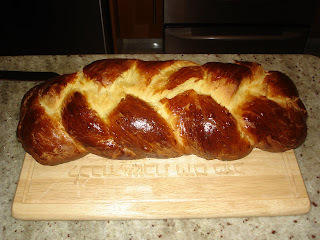 Then I braided the Challah and let it rise for another hour. Then I painted the Challah with a brush using a mixture of egg yolk and heavy cream (which gives it its beautiful glow when baked) and baked it in the oven as recipe required until it was golden brown. Beautiful. I should add that this Challah makes wonderful french toast that will completely wow your brunch guests. I should add that I've made a couple other kinds of bread as well - pumpkin bread, brioche, and beer bread (see my earlier blog entry). The brioche was another interesting story. This time I used a King Arthur recipe for chocolate cherry brioche, a dessert bread. King Arthur Flour is the best bread flour to use in any bread-making adventure. This particular recipe called for instant yeast. I followed the instructions, which were not clear about what to do with the yeast. My husband was not especially enthusiasic about the cherries in this recipe - Brad refuses to eat cherries because they remind him of an unpleasant scene from a movie called "The Witches of Eastwick." This is why I generally do not make cherry pie. But this time, the cherries were in. I figured the instant yeast did not need to be activated because that was the definition of the word instant, right? Well, this brioche did not rise. A few weeks later I made brioche again using a different recipe (no chocolate or cherries and using regular dry active yeast in water) and it worked perfectly. I still have not figured out how to use instant yeast. However, next time I have a recipe that calls for instant yeast, I plan on substituting dry active yeast in warm water. We'll see if that works. I was thinking of making ice cream again - this time rocky road. However, I'm kind of tired and recovering from a cold right now - my husband is helping prepare our dinner tonight (southwestern chicken with a spinach-cilantro sauce). I'll get to it when I feel better. Nothing like ice cream to deal with life's normal frusterations, right?